I require my students to purchase a composition notebook and a folder. I try to keep the cost down (e.g., no carbon copy notebook), as they also have to purchase their own textbooks, review books, exam fees, and class t-shirt. Why the folder? They keep their rubrics and any lab packets that accompany their work in one handy place. Here is what I give my AP students on day 1 of class. They tape this in the inside of their composition notebook and set up their notebook (most students bring their supplies day 1- I have a few extra composition notebooks lying around for any stragglers). Everything is in one place for both me and students. Leaving the left-hand side of each page for scratchwork is a genius idea - I wish I could take credit. Some students used it all the time, some never used it. However, it allows me to see more of the progression in thinking, instead of the cleaned-up final product. Note: I did allow students to draw arrows to what they wanted me to grade on the left side so they did not have to rewrite everything. If I want to document student work, I had to take pictures or re-type their work. This method can be tricky for some POGIL-like labs, and I have had to learn to be very clear to students how this translates into their notebook. 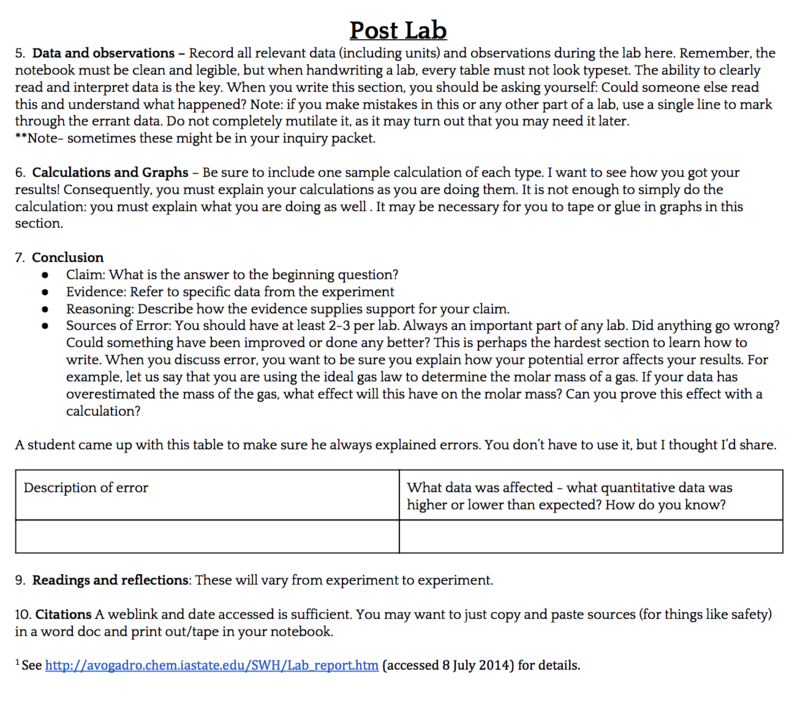 My students have told me that without posting the individual lab rubrics, a lab packet with embedded questions in addition to the final notebook write-up can be a bit confusing. 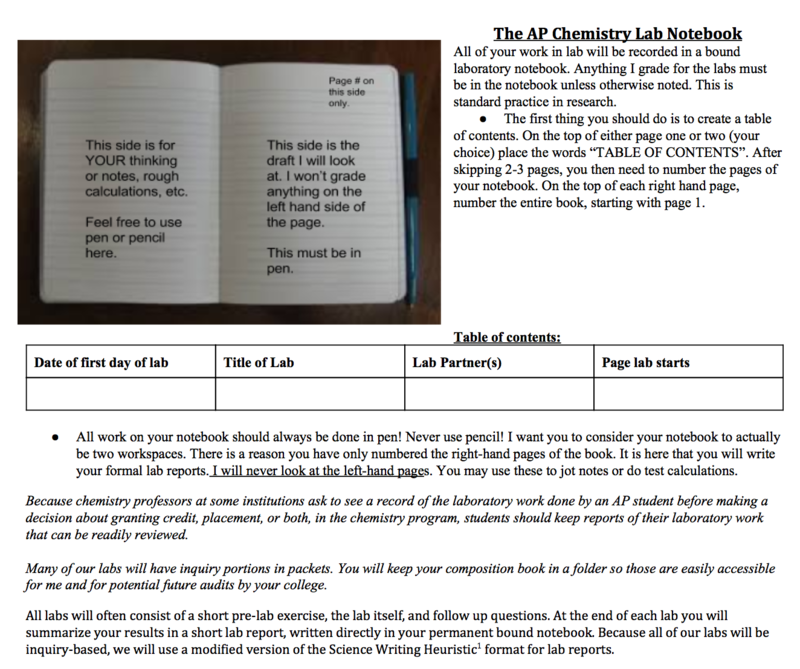 Day 2 of AP Chemistry is their first lab - decomposition of NaHCO3 as a stoichiometry review (basically the Flinn lab with a few edits, posted below along with the rubric) and practice using their lab notebooks right away. What have you found that works or doesn’t work (just as valuable to share) in your context? Please share below! Decomposition of sodium bicarbonate lab- based upon Flinn Scientific's published work. Decomposition of sodium bicarbonate lab rubric.